Astronomers using ESO’s Very Large Telescope have discovered by far the brightest galaxy yet found in the early Universe and found strong evidence that examples of the first generation of stars lurk within it. These massive, brilliant, and previously purely theoretical objects were the creators of the first heavy elements in history — the elements necessary to forge the stars around us today, the planets that orbit them, and life as we know it. The newly found galaxy, labelled CR7, is three times brighter than the brightest distant galaxy known up to now. Astronomers have long theorised the existence of a first generation of stars — known as Population III stars — that were born out of the primordial material from the Big Bang . All the heavier chemical elements — such as oxygen, nitrogen, carbon and iron, which are essential to life — were forged in the bellies of stars. This means that the first stars must have formed out of the only elements to exist prior to stars: hydrogen, helium and trace amounts of lithium. These Population III stars would have been enormous — several hundred or even a thousand times more massive than the Sun — blazing hot, and transient — exploding as supernovae after only about two million years. But until now the search for physical proof of their existence had been inconclusive . A team led by David Sobral, from the Institute of Astrophysics and Space Sciences, the Faculty of Sciences of the University of Lisbon in Portugal, and Leiden Observatory in the Netherlands, has now used ESO’s Very Large Telescope (VLT) to peer back into the ancient Universe, to a period known as reionisation, approximately 800 million years after the Big Bang. Instead of conducting a narrow and deep study of a small area of the sky, they broadened their scope to produce the widest survey of very distant galaxies ever attempted. Their expansive study was made using the VLT with help from the W. M. Keck Observatory and the Subaru Telescope as well as the NASA/ESA Hubble Space Telescope. 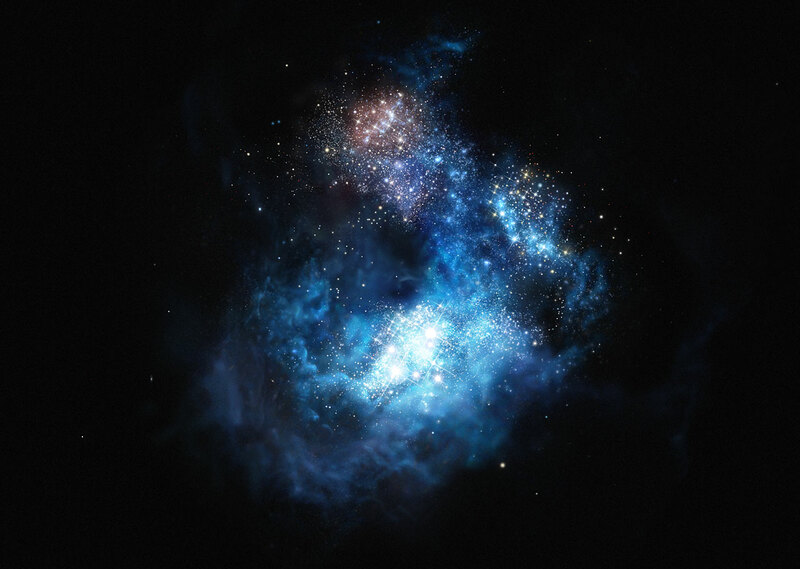 The team discovered — and confirmed — a number of surprisingly bright very young galaxies. One of these, labelled CR7 , was an exceptionally rare object, by far the brightest galaxy ever observed at this stage in the Universe . With the discovery of CR7 and other bright galaxies, the study was already a success, but further inspection provided additional exciting news. The X-shooter and SINFONI instruments on the VLT found strong ionised helium emission in CR7 but — crucially and surprisingly — no sign of any heavier elements in a bright pocket in the galaxy. This meant the team had discovered the first good evidence for clusters of Population III stars that had ionised gas within a galaxy in the early Universe . Further observations with the VLT, ALMA, and the NASA/ESA Hubble Space Telescope are planned to confirm beyond doubt that what has been observed are Population III stars, and to search for and identify further examples. The name Population III arose because astronomers had already classed the stars of the Milky Way as Population I (stars like the Sun, rich in heavier elements and forming the disc) and Population II (older stars, with a low heavy-element content, and found in the Milky Way bulge and halo, and globular star clusters). Finding these stars is very difficult: they would have been extremely short-lived, and would have shone at a time when the Universe was largely opaque to their light. Previous findings include: Nagao, et al., 2008, where no ionised helium was detected; De Breuck et al., 2000, where ionised helium was detected, but alongside carbon and oxygen, as well as clear signatures of an active galactic nucleus; and Cassata et al., 2013, where ionised helium was detected, but of a very low equivalent width, or weak intensity, and alongside carbon and oxygen. CR7’s nickname is an abbreviation of COSMOS Redshift 7, a measure of its place in terms of cosmic time. The higher the redshift, the more distant the galaxy and the further back in the history of the Universe it is seen. A1689-zD1, one of the oldest galaxies ever observed, for example, has a redshift of 7.5. CR7 is located in the COSMOS field, an intensely studied patch of sky in the constellation of Sextans (The Sextant). The nickname was inspired by the great Portuguese footballer, Cristiano Ronaldo, who is known as CR7. CR7 is three times brighter in terms of ultraviolet light emission than the previous titleholder, Himiko, which was thought to be one of a kind at this very early time. Dusty galaxies, at later stages in the history of the Universe, may radiate far more total energy than CR7 in the form of infrared radiation from warm dust. The energy coming from CR7 is mostly ultraviolet/visible light. The team considered two alternate theories: that the source of the light was either from an AGN or Wolf–Rayet stars. The lack of heavy elements, and other evidence strongly refutes both these theories. The team also considered that the source may be a direct-collapse black hole, which are themselves exceptional exotic and purely theoretical objects. The lack of a broad emission line and the fact that the hydrogen and helium luminosities were much greater than what has been predicted for such a black hole indicate that this, too, is unlikely. A lack of X-ray emissions would further refute this possibility, but additional observations are needed. This research was presented in a paper entitled “Evidence for PopIII-like stellar populations in the most luminous Lyman-α emitters at the epoch of re-ionisation: spectroscopic confirmation”, by D. Sobral, et al., is accepted for publication in The Astrophysical Journal. The team is composed of David Sobral (Instituto de Astrofísica e Ciências do Espaço, Universidade de Lisboa, Lisbon, Portugal; Departamento de Física, Faculdade de Ciências, Universidade de Lisboa, Lisbon, Portugal; Leiden Observatory, Leiden University, Leiden, The Netherlands), Jorryt Matthee (Leiden Observatory), Behnam Darvish (Department of Physics and Astronomy, University of California, Riverside, California, USA), Daniel Schaerer (Observatoire de Genève, Département d’Astronomie, Université de Genève, Versoix, Switzerland; Centre National de la Recherche Scientifique, IRAP, Toulouse, France), Bahram Mobasher (Department of Physics and Astronomy, University of California, Riverside, California, USA), Huub J. A. Röttgering (Leiden Observatory), Sérgio Santos (Instituto de Astrofísica e Ciências do Espaço, Universidade de Lisboa; Departamento de Física, Universidade de Lisboa, Portugal) and Shoubaneh Hemmati (Department of Physics and Astronomy, University of California, Riverside, California, USA).